(b) Whether Government has received any representation against non-implementation of CAT orders by any Ministry and if so, the details in this regard and the action proposed to be taken on non-implementation of Court / CAT orders? 2. 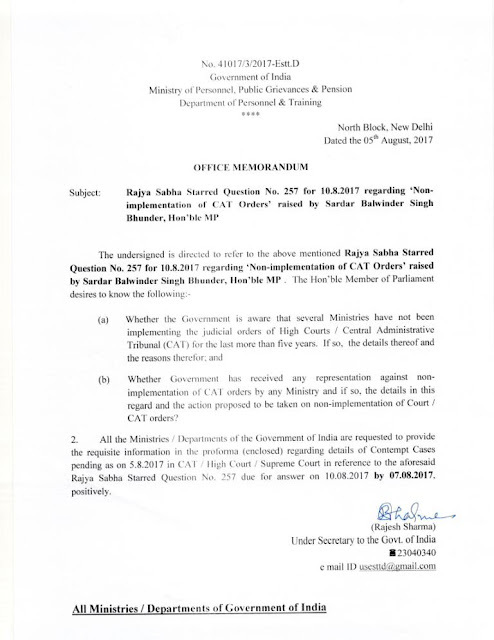 All the Ministries / Departments of the Government of India are requested to provide the requisite information in the proforma (enclosed) regarding details of Contempt Cases pending as on 5.8.2017 in CAT / HighCourt / Supreme Court in reference to the aforesaid Rajya Sabha Starred Question No. 257 due for answer on 10.08.2017 by 07.08.2017, positively.